Elephants fighting for the entertainment of nobility, 1875. Kottiar canoes passing "Round Island"
In Śrī Lanka no other animal has been associated for so long with the people in their traditional and religious activities as the elephant. This association dates back to the pre-Christian era, more than 5,000 years. Ancient Sinhalese kings captured and tamed elephants which used to abound in the country. Various methods of capture were employed, some indigenous, others introduced by neighbouring kings and countries that conquered and ruled Sri Lanka. Gradually the number of elephants captured increased. All elephants were kept by the king in his stables. The methods of capture were refined and modified as time went on. Elephants, suitably caparisoned, have and still take part in ceremonial, cultural and religious pageants and processions. Elephants have been used by man in his wars in Europe and Asia. They have assisted him in his logging operations and construction works. In this country too elephants have fought in wars and featured in various sports and combat during Sinhala celebrations. In India they have provided transportation for sportsmen indulging in shikars. During the time of the Sinhala kings the elephant was afforded complete protection by royal decree. The penalty for killing an elephant was death. With the advent of the British this protection was withdrawn. Large numbers of elephants were killed by the British under the guise of sport. Not only did the British government encourage and condone killings as a sport but it also paid a bounty for each elephant killed, deeming the elephant an agricultural pest. In Sri Lanka the variations in physical appearance amongst elephants were noticed and recorded in ancient Sinhala manuscripts. There are ten such groups or ‘castes'. These differences do not seem important now. The first record of the association between man and elephant in Sri Lanka was recorded in the 1st Century BC on an inscription at Navalar Kulam in Panama Pattu in the Eastern Province, of a religious benefaction by a prince who was designated "Ath Arcaria" or Master of the Elephant Establishment. The Elephant Establishment was called the "Ath panthiya". The ruins of the ancient cities in Sri Lanka abound with carvings of elephants in many forms, attesting to the close association between man and elephant. Sinhala literature of the 3rd Century BC indicates that the state elephant or Mangalahatti was the elephant on which the king rode. This elephant was always a tusker and had a special stable called the hatthisala. The post to which it was tethered was called the alheka. A 12th Century inscription on a stone seat at Polonnaruwa records that King Nissanka Malla sat upon it while watching elephant fights. These fights were staged for the entertainment of nobles. A rock sculpture of an elephant on the banks of the Mahaweli River was described thus by archaeologist H.C.P. Bell: "This piece of animal sculpture is probably unique in Ceylon. Cut in full round from a rock, life-size, are the head and shoulders of an elephant whose feet the river washed when low. The elephant stands in the water, looking slightly upstream, as though hesitating to cross. At present the river in semi-flood reaches its eyes. There are signs of ‘sets' for some building's foundations on a boulder adjoining, but no ruins or inscriptions are known likely to afford a clue to the object of this solitary tour de force of a skilful sculptor," (Bell & Bell, 1893). Unfortunately this rock sculpture no longer exists having been blasted probably by fishermen dynamiting fish. The first description of the capture of elephants in 40 AD is by Pliny. Here, the information that he gathered was from the Sinhalese ambassador to the court of the Emperor Claudius. Elephants were used on all important ceremonial occasions especially where pomp and pageantry were required. The annual Perahera in Kandy, which dates back nearly 220 years, brings together well over a hundred elephants that parade the streets during the nights on certain pre-determined days in July-August each year. New Year festivities in Sri Lanka feature elephants in various sports and competitive combat. Elephant fights were a popular form of Sinhala sport in early times and was called "Gaja Keliya". Being built like a tank, elephants were used in war not only as a means of transport but also as an instrument of defence and offence. They were used to ram barricades and, as Ives points out "in time of war, they now and then fix a heavy iron chain to the end of their trunks, which they whirl around with such agility, as to make it impossible for an enemy to approach them at that time". 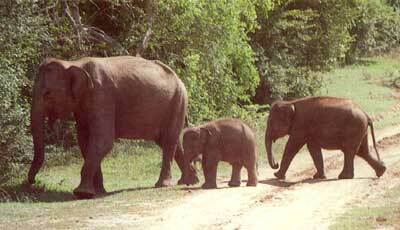 From the earliest of times there had been a significant demand for Sri Lankan elephants from other countries. Aelian, quoted by Emmerson Tennent in1859, says that the export of elephants from Ceylon to India had been going on without interruption from the period of the First Punic War. India wanted them for use as war elephants, Myanmar as a tribute from ancient kings and Egypt probably for both war and ceremonial occasions. The elephants from Sri Lanka were found to easily adapt for war and were considered better than those from the mainland. Their excellent qualities were well known to the Greeks even as far back as the 3rd Century BC, in the time of Alexander the Great. Onescritus, who was an Admiral of the Fleet of Alexander the Great and probably the first European to describe the trained elephants of Ceylon, has stated that the elephants from Taprobane (later Ceylon and then Sri Lanka) "are bigger, more fierce and furious for war service than those of India,". Greek writers like Megasthenes (circa 300 BC) and Aelian (44AD) corroborate this. Sixth Century writer Cosmos Indicopleustes says that the elephant from Sri Lanka was highly priced in India for its excellence in war. Elephants from Sri Lanka were exported to Kalinga by special boats from about 200 BC. From the port of Mantai the present day Mannar. Such exports are also recorded by Ptolemy in 175 AD. By this time Sri Lanka had also earned a reputation for skilled elephant management. 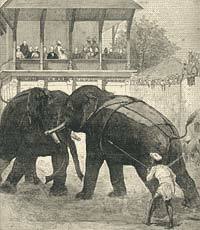 The Sinhala kings had special elephant trainers. They were the Kuruwe people from Kegalle. Training elephants caught from the wild, for both traditional purposes and war, was the responsibility of these people. Even persons (mahouts) who looked after the elephants after their training were trained by the Kuruwe people. A brass model of an elephant with a number of movable joints was used in the training of the mahouts. Records show that even though Sri Lanka was exporting a large number of elephants in the 5th and 6th centuries BC, a number of elephants were also imported into the country after the 4th Century BC. This is apart from the gifts that the ruling monarchs of India and Myanmar, (then Burma) sent from time to time. The Culavamsa (Ch. LXXVI) records that during the reign of King Parakrama Bahu (1153-1186 AD), King Ramana of Myanmar decreed that the practice of selling elephants from his kingdom for export should henceforth be stopped. "Moreover with evil intent, the king also set a high price on the beasts, commanding that the elephants which were sold in former times for a hundred nikkhalas of silver, or a thousand, should now be sold for two thousand or three thousand and he likewise put an end to the ancient custom of giving an elephant to every ship that bore presents to the king [of Sri Lanka]." The chronicle goes on to say that Prakrama Bahu made war on the King of Burma and subdued him. Later, the Burmese relented and said "Take henceforth from us as yearly tribute, as many elephants as are necessary." Records of the 12th Century AD again show that elephants continued to be imported from Burma. The export of elephants too continued and this is confirmed from time to time by writers on Ceylon - Sinhala Chronicles (15th Century), Athanasius Nikitin the Russian traveller (1470). Add-er-Razzak (1442) refers to the trade in elephants between Calicut and Ceylon. Andrea Corsall and Durate Barbosa (1514) refer to the Royal monopoly of elephants - a good elephant fetched 1,500 ducats on the Malabar Coast at that time. Ribeiro (1836) states that "As the Ceylon elephant was superior, traders were prepared to pay twice or even up to four times for them compared to elephants from other countries." There are a number of references in early writings to man's association with and his use of elephants. The Mahawamsa (Sri Lanka's chronicle of history) details many such instances, especially that of Kandula the elephant on which King Dutugamunu (200 BC), rode to war. Dutch, Portuguese and British reports and books record several instances of elepant capture, their use by the Sinhala Kings in their armies, elephant fights and the execution of criminals by elephants. In certain instances the strength of a King or Potentate was judged by the number of elephants he used in war. The King of Kandy maintained a special unit that dealt with all matters concerning elephants including their capture, training, conservation and export. This unit was under the chief officer known as the Gajanayake Nilame. The Gajanayake Nilame, was of a high caste and received many favours, including land, from the king. The elephant catchers and keepers were from the lower castes. During the times of the Sinhala kings, even though there were tens of thousands of elephants in all parts of the country, this animal was afforded complete protection by royal decree. Accordingly, no elephant could be captured, killed or maimed without the king's authority. All offenders were punished by death. Unlike today the cultivators of that time could not plead that the elephants were harmed in the protection of their crops. Any depredation or damage to crops by wild elephants had to be prevented by stout fencing together with organized and effective watching by the farmers. It is interesting to note that though there were many more elephants then than now, Sri Lanka was considered to be the granary of the East. When the Portuguese captured the maritime provinces of Sri Lanka they found a flourishing export trade in elephants. They too, quickly got involved in the elephant export trade, and at first obtained their elephants as tribute from the Sinhala people through their leaders. Thereafter they captured animals on their own. The Portuguese also set up a revenue-gathering unit, similar to the king's organization, known as the Elephant Hunt. 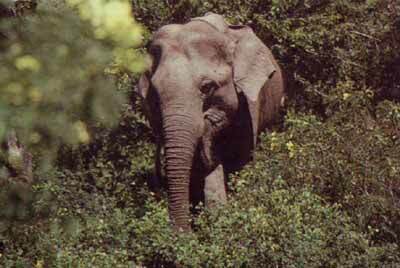 Abeysinghe (1966) wrote that the Portuguese maintained an annual demand of 37 elephants for export from two kraals. These were valued at 9,250 rix dollars which was equal to 15% of the total revenue of the state. In 1507 the Viceroy of India sent a gift of a small elephant, imported from Ceylon, to King Manuel of Portugal. After seven years in Lisbon this elephant, named Annone, was presented to Pope Leo X and moved to Rome. Annone lived in Rome for three years but died after developing stomach trouble due to the variety of food given to it by visitors and admirers. There is a memorial in Rome to Annone the first elephant in the Vatican (Hulugalle, 1969). The King's Elephant Unit continued to operate within the Kandyan kingdom even after the Portuguese occupation of the Maritime Provinces. Latterly however, the function of the King's Elephant Unit was only to supply the king's army with elephants. This was because with the development of cannons and musketry, the elephant was both frightened and vulnerable, and its export demand as an instrument of war was greatly reduced. During the reign of the Portuguese the person in charge of the Elephant Hunt was called the Gajanayake. The Gajanayake was in charge of stables at Matara. This was a large establishment. In 1697 there were 97 elephants in the stables at Matara. Baldeus wrote, in 1704, of a place in Matara where captured wild elephants were tamed before they were sold to buyers who came from the Coramandel Coast and Bengal. A very large stable had been built to house these animals. These stables at Matara are the site of the present Kachcheri. The animals apparently were bathed twice a day in a nearby river, very likely the Nilwala. Tame elephants were used as monitors and trainers. Those people who were sent into the jungles to look for suitable herds of elephants to be captured in kraals were called Baddenas. When the herds were sighted, the Dissawa of the area was informed and he in turn gave instructions for arrangements to be made to hold the kraal. The men, numbering over a thousand, were divided into four groups under a leader called a Hattrebethmarale. The Aratchies were those in charge of the trappers who noosed the elephants once there were inside the Kraal and also trained the captured elephants. In 1586 the king of Kandy, Rajasingha I, led an army which included a strong force of 2,200 highly trained elephants for fighting and for other services, and laid siege on the Portuguese fort in Colombo. The siege however, was not successful. It is recorded that, in 1706, the king of Kandy had in his stables over 300 tuskers. The elephant was used less and less for war and subsequently only for ceremonial occasions. In 1656 the Dutch laid siege on the Fort of Colombo held by the Portuguese. Ribeiro, the Portuguese soldier and historian, records that all the elephants in the Fort excepting one, were eaten by the defenders as they ran short of food after a time. Only one elephant was spared because it was needed to carry timber to repair the defences that were being damaged by the attackers. Robert Knox, a Scotsman, who was a prisoner in the Kandyan kingdom for nearly 20 years, writing in the 17th Century, stated "that the King makes use of them (elephants) as executioners: they will run their teeth [tusks] through the body, and then tear it in pieces, and throw it limb for limb. They have a sharp iron with a socket with three edges, which they put on their teeth at such times; for the elephants that are kept have all the ends of their teeth cut to make them grow better, and they do grow out again. Sirr (1850) also says that elephants were used as executioners of criminals, by training them to crush the victim's limbs and placing one of its legs on the man's body, tear off the limbs. Fortunately, the use of the mild tempered elephants for such gruesome executions has long been stopped. Pybus states that the Dutch had to obtain permission from the king of Kandy to capture elephants which were within his domain. The king generally agreed to the Dutch capturing 20 to 30 animals each year, but the Dutch constantly exceeded this figure, capturing around 150 each year and 200 in one year. They continued to use the elephant stables at Matara referred to earlier. Elephants were also exported by the Dutch from Karativu island. The elephants were driven into the Jaffna peninsula by a shallow ford that separated it from the mainland. This ford has now been bridged and given the name Elephant Pass. The Dutch held an annual sale of elephants in Jaffna. Elephants caught in Kraals and those received as tribute were sold there. Buyers from the Coramandel and the Bengal coasts continued to attend these sales regularly. 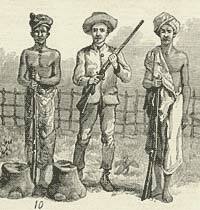 The traditional methods of capture by noosing etc., were practised for a much longer period. However, in 1761 the Dutch Governor Becker made a decree prohibiting the use of pits and nooses for the capture of elephants. This was in a bid to keep the mortality rate among the captive elephants low. The form of noosing practised in northern Ceylon was different to the noosing methods of the Eastern Province and other parts of the country. A large noose was suspended from a strong tree with a man or several men on the tree to manipulate the noose. Elephants were then driven towards the tree with the noose. With this ban, kraaling became the only method of capture that could be employed. When the British captured the Maritime Provinces from the Dutch in 1796, and later the Kandyan Kingdom in 1815, they continued the capture of elephants for some time but on a low-priority basis. The British however, indulged in the shooting of elephants as a form of sport. Elephant populations that had been able to withstand the detrimental effects of capture all these years now started diminishing rapidly with the wanton and indiscriminate destruction of the elephant herds. Major Thomas Rogers is credited with having shot over 1,500 elephants. This works out to an average of one elephant being killed by him every day for four years. Two others, Captain Galleway and Major Skinner are reputed to have shot half that number each. Many other ‘sportsmen' have shot in the region of 250-300 animals during this time. As the elephant was a threat to the agricultural activities of the rural population, the British provided guns freely to villagers to keep away the marauding elephants from their cultivations. This action, which seemed necessary at that time, added to the destruction of the elephant. Farmers, who had hitherto protected their crops from marauding elephants by other means, now had a much easier method. They shot at them and either maimed or killed them. The British were also interested in developing plantation crops in addition to subsistence crops. British planters, who were opening up the railways and roads along with coffee and later tea plantations, also shot trespassing elephants at will. Here again the purported protection of their crops seemed to justify their actions. The planters combined their sport and the protection of their plantations and shot elephants at will, so much so that the once large elephant population in the hills dwindled rapidly. The British did away with the Elephant Department started by the Sinhalese and the Elephant Hunt maintained for the occupied areas by the Portuguese and the Dutch. They also greatly reduced the number of kraals that were held. In fact in 1828 the British passed a law prohibiting the capture of elephants except for the government. This law was rescinded in 1831. The Kandyan chiefs, however, continued holding kraals and it is recorded that from 1800 to 1900, fifty two kraals were held. The last Kraal was held in 1952.